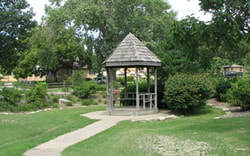 Say Your I Do's Under this Charming and Whimsical Mini Gazebo. Perfect for Gatherings of 4 to 20 guests. Secure your wedding date today with a non-refundable reservation deposit of $45. Balance of $50 due 2 weeks prior to ceremony. May reservations must be secured no later than April 20th or until unavailable. After the Ceremony head on out to the Woodfire Grille in Mulvane for a Mouth Watering Steak to Celebrate Your I Do's!